Wellness for the World: How Toxic is Your Liver? You are reading this sentence, therefore I can be bold enough to assume that you are toxic and your liver is taking the brunt of this toxicity. It is simple, if you live on this earth, you ARE toxic. There have been studies to measure levels of toxicity across the planet we live on and honestly, even the breast milk of women in the wilderness areas of Alaska show toxic levels of PCB's and other toxic chemicals. I'll even go a couple of steps further and suggest that most of us share a very similar level of toxicity. So obviously the key is not looking for a non toxic area of our planet. One of the keys is to lessen the load taken on by your liver. Let's first understand the basics of your liver. 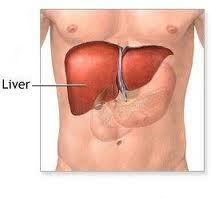 The Liver is the second largest organ (after the Skin) in the body and comprises 2.5% of the body's weight. The Liver participates in functions associated with the Cardiovascular System, Digestive System, Excretory System and Metabolism. The Liver stores and filters the blood to remove infectious organisms, while processing approximately three pints of blood every minute. The Liver is the primary organ for the detoxification of toxic chemicals that enter the body through a phase I and phase II detoxification. The phase I enzymes in the liver directly neutralize many toxic chemicals or convert them into metabolites. Unfortunately, often these metabolites are more toxic than their precursor toxins. Phase II Enzymes in the liver process the metabolites of toxins produced by phase I enzymes. This is why it is important to address both the phase I and phase II of liver detoxification. When I am suspecting liver challenges with my clients I generally recommend a simple urine analysis that will expose your phase I and phase II liver detoxification pathway function. One other side note to address is something I would refer to as phase III. This is the release of toxic substances via your colon. Remember that while the liver is a primary organ of detoxification, it is not an organ of elimination. Any toxins dealt with in the liver exit via your colon in your bowel movements. This is one of the many reasons it is so important to achieve the optimal 2 or more bowel movements daily. How can you recognize potential liver issues even without testing? Here are some common symptoms as tied into liver imbalances. Halitosis (bad breath) can be caused by malfunctions of the liver. Mature age acne and/or rosacea often occur as a result of liver malfunction. Often there will be a tenderness in your back between the shoulder blades when the liver is challenged. Another suspect in chronic liver issues would be a brown pigment in the sclera (whites) of the eye. I would also add that impaired adrenal function, which you hear me discuss often, can also lead to liver dysfunction. There is plenty of information on supplement use for the liver, so I want to provide non supplemental info for you below. Well most understand that alcohol and the liver an not the best of friends. This is due to the fact that the liver is responsible for the metabolism of 90% of ingested Alcohol. Keeping alcohol consumption to a minimum goes a long way in addressing this issue. Besides alcohol avoid excessive chocolate, caffeine, trans fats, refined sugar and wheat, soft drinks, as well as fried foods, and highly processed foods. Also, minimize your consumption of smoked, cured and salted foods. An over abundance of certain minerals (both essential and heavy metals) can also create challenges in the liver. Aluminum, arsenic, cadmium, mercury as toxic heavy metals as well as copper, iron, sodium and nickel in excess can create liver issues. Extremely high levels of Vitamin B3 as well as excessive consumption of PABA and Vitamin A can also create liver challenges. Aflatoxins can also seriously damage the liver. An aflatoxin is a toxin typically produced by a mold that grows in nuts, seeds, and legumes. Cotton seed oil as well as excessive consumption of garlic can also damage the liver. Any pharmaceuticals drugs are also metabolized in the liver and create potential problems. Obviously you do not want to nor would I recommend that you discontinue and prescription use without consent and direction from your doctor. Lastly, I would like to mention that the liver reactions intensely to the emotion of anger. If suppressed anger or regular over reactions of anger are a regular part of your life, I would suggest that you address this. Visit the Depke Wellness Energetic Release page for more information. This should be provide you with some of the necessary information to begin lessening the toxic load on your liver. If you have any questions or comments on this article, feel free to leave me a post below and I will address this personally.